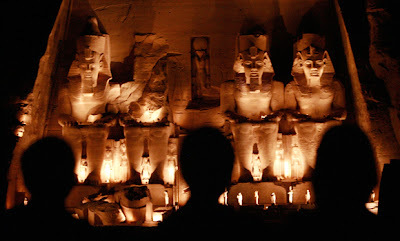 Mindful of the brilliant illumination of the boat the previous evening, at Wady Halfeh, it occurred to us that we might realize somewhat of the ancient glory of Abou Simbel by lighting it with our coloured lanterns. Abd-el-Atti entered into the idea with his accustomed alacrity, and I went up into the temple to advise and assist in the desposition of candles and lanterns, while the ladies, who did not go into the temple on our passage up, waited on board until the illumination was complete. The sand hill was almost impassable. It was like climbing a snow bank fifty feet high, the feet going in deep and slipping far back at every step, so that we had to lie down and breathe several times before we reached the top and descended into the doorway of the temple. When our arrangements were complete we returned and brought the ladies up. The procession was picturesque. Two blazing torches led the way, and four more brought up the rear. It was vain to resist such an appeal, and we answered it instantly; whereat the voices changed, and the men emerged from their hiding-places with shouts of thanks.